The second is obviously the priority, even if it means parting with some combination of Brandon Ingram, Lonzo Ball and Kyle Kuzma. Ideally, the Lakers would be able to land a second star in free agency and keep the core intact. However, with Anthony Davis unlikely to become available by the deadline, that particular dilemma may be a moot point this season. Lonzo Ball was selected by the Los Angeles Lakers with the second pick of the 2017 NBA draft. The point guard averaged 10.2 points, 7.2 assists, and 6.8 rebounds in his debut season and was named to the All-Rookie Second Team. Meanwhile, Kyle Kuzma was traded to the Lakers immediately after being picked by the Nets in the 2017 draft, and Kuzma is this season averaging 19.1 points, 5.9 rebounds, and 2.5 assists. Finally, Brandon Ingram has been with the Lakers since 2016, and during his time in Los Angeles, the 21-year-old has averaged 13.1 points, 4.7 rebounds, and 2.9 assists. In the absence of LeBron James, the Lakers have struggled, and the limitations of the current roster have been on full view. Magic Johnson has evidently not been impressed with the team's recent performances, and it seems that the Lakers are now finally willing to break up their much talked about young core. The Lakers will be looking to end their three-game losing streak as they take on the struggling Phoenix Suns on Sunday. 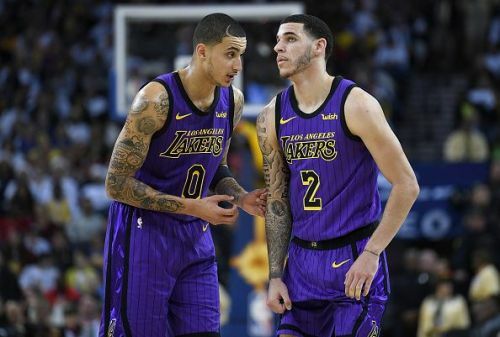 Let us know in the comments below if you think the Lakers should trade away their young core. Also visit our dedicated basketball section for the latest news, rumors andanalysis.